Rosie Heim — a former Honorary Mayor of Land O’ Lakes, and a former president of the board of the Lutz-Land O’ Lakes Woman’s Club — has succumbed to her battle with cancer. She will be remembered in a celebration of life service on April 13 at 10:30 a.m., at Holy Trinity Lutheran Church, 20735 Leonard Road in Lutz. A reception will follow. 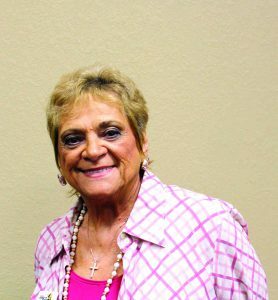 Rosie was widely known around Central Pasco for her willingness to serve local organizations, and as an Avon representative — who always dispensed her brand of good cheer, while delivering her customer’s orders. Mary Rathman, editorial assistant at The Laker/Lutz News, a regular customer, developed a deep affection for Rosie. “I’ll miss her smiles and hugs,” said Rathman, who admired Rosie’s ability to remain upbeat, despite her grim prognosis. “She just had such an amazing attitude throughout her ordeal and she was always happy,” Rathman said. When Rosie decided to toss her hat into the ring for a run at honorary mayor of Land O’ Lakes, she did so with the intention of raising the profile of the GFWC Lutz-Land O’ Lakes Woman’s Club. The club is already widely known in Lutz, but she wanted more people in Land O’ Lakes to become familiar with the club and its good works. Pat Serio, a member of the woman’s club, considered Rosie to be a dear friend. “We’ve worked together on more projects and issues than I could possibly count,” Serio said. “All our (club members) hearts are very heavy with our loss of this wonderful woman after her very valiant battle with cancer,” she added. In Rosie’s quest to win the Land O’ Lakes title, she hosted eight events. For Rosie, it was never about being a member of a particular clique — she believed in reaching out to everyone. 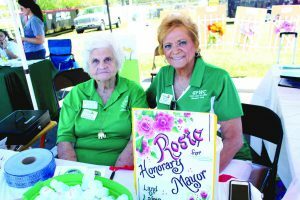 Gloria Dale and Rosie Heim worked a booth at Land O’ Lakes Music Festival in 2017, as Heim made an effort to drum up support for her bid to become the new Honorary Mayor of Land O’ Lakes. Dale is the deputy honorary mayor, a title she’s been given for life. She was involved with Women-N-Charge, a women’s networking group. She was also involved with AARP and with other groups. She was always looking to recruit more members to the woman’s club because she saw a need to help with community services. She also saw the need to develop reinforcements, as members of the woman’s club grow older and are unable to do as much volunteering as they did in the past. She also was a cheerleader for the Central Pasco Chamber, too. She looked forward to presiding at ribbon cuttings and representing the chamber in the Lutz Fourth of July Parade. Before she retired, she was a special needs school assistant at Denham Oaks Elementary. Elayne Bassinger, who was Rosie’s friend for 15 years, but particularly close to her during the last five years, said Rosie’s passing has left a hole in her heart. “She had a remarkable, caring, giving, dynamic spirit — with a bit of spitfire thrown in,” Bassinger said. “She was an inspiration to those who were fortunate enough to know her, and I was blessed to call her my friend,” Bassinger added. Rosie possessed a can-do spirit and a great sense of humor, Bassinger said. “Her heart was true community service,” Bassinger said. Rosie enjoyed being involved, and was thrilled when some of that goodwill was returned during a pasta dinner fundraiser she held when she was campaigning to become honorary mayor. She described the pasta dinner, in a 2017 interview. It was incredible, she recalled. Rosie is survived by her husband, Charlie; her son, Daniel; her daughters, Sharon and Dawn, and her grandchildren.